On 28 January the Polish Union of Entrepreneurs and Employers proposed granting residence permits to a million migrants currently in Poland. The majority of them are Ukrainians, followed by Belarusians and Vietnamese. In recent years Poland has been aiming its immigration policy at absorbing a young labour force from the regions of former Polish rule, and has created unique preferences for foreign citizens in the form of the Card of the Pole. 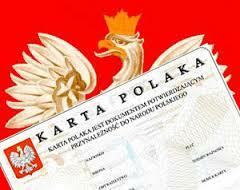 The card gives its holder the right to work and study in Poland, and later to obtain Polish citizenship. Many Belarusians see it as an opportunity to work and study in Poland with the prospect of getting EU citizenship in the conditions of the ongoing economic crisis. The authorities of Belarus definitely dislike the initiative, but have proved unable to counter it so far. On 28 January the Polish Union of Entrepreneurs and Employers in a publication estimated that due to the demographic crisis, by 2050 Poland will need to accept between 2m and 5m migrants to retain current economic growth rates. Currently, around one million people, mainly from Ukraine and Belarus, are employed in the Polish economy. Thanks to them the Polish budget receives an extra €1.5-2bn annually. In an interview with Gazeta Prawna, union head Cezary Kaźmierczak said that migrants from these countries are “the best in the world”. They do not take away jobs from Poles and cost nothing for taxpayers. He contrasted them to migrants from the Near East and Africa, who in most cases do not work and live on social benefits. As discontent with current EU migration policy grows in Poland, Belarusians and Ukrainians are increasing their chances of becoming resident in Poland. In 2008 Poland introduced a Law on the Card of the Pole, which targeted the population of lands formerly ruled by Poland in Belarus, Ukraine and the Baltics. The card gives its owner the right to get a long-term free Polish visa, legally work, do business and study in Poland on an equal footing with Polish citizens, as well as offering some other benefits. To get a card, one needs to demonstrate documented proof of ancestors living in Poland in 1921-1939. Poland at that time included the current western Belarusian territories. Alternatively, one must make a considerable contribution to Polish culture to receive the card. These criteria makes a few hundred thousand Belarusians potentially eligible for the card. In 2013 the Polish authorities announced that they had granted the Card of the Pole to 42,000 Belarusians. The current number of card owners in Belarus remains unknown, as Polish officials are reluctant to reveal the latest figures. According to Eurostat, around 70,000 Belarusians have received national long-term visas, which gives an approximate indication of the number of Pole card holders in Belarus. In November 2015 a special commission of the Polish parliament recommended an amendment to the Law on the Card of the Pole, which would allow its owner to get Polish (and EU) citizenship after living in Poland for only one year. Moreover, the card owners would receive a grant of around €5,400 per family member to cover their adaptation costs, as well as professional and language training. In 2012 the Constitutional Court of Belarus announced that the Law on the Card of the Pole contradicts international law and violates a number of bilateral agreements. The government also made amendments to the law on the civil service which forbids officials from having a Pole card and similar documents from other states. Andrei Jelisiejeŭ, migration expert from Belarus, told Belarus Digest that few countries would tolerate the fact that a considerable number of their citizens, including officials, declare themselves loyal to another state. He recalled the reaction of Lithuanian officials to the Card of the Pole law in 2009, when Lithuanian MPs tried to restrict card holders' right to run in parliamentary elections. The negative reaction of the Belarusian authorities is justified. The Card of the Pole will cause a drain on the Belarusian labour force and strengthen the influence of Poland, a NATO member and ardent critic of Lukashenka, on the Belarusian population. However, the authorities unwisely stimulate the rush for a Card of the Pole by protracting visa liberalisation with the EU and blocking small local border traffic with Poland. Many Belarusians would be satisfied just with free Schengen visas to shop in nearby Poland and Lithuania. With the Card of the Pole they receive a more alluring opportunity to get EU citizenship. The economic situation in Belarus has been worsening for the last two years, and the coming years do not look bright either. Russia, which traditionally served as a migration hub for many Belarusians, is also declining and in addition getting increasingly aggressive and xenophobic. These developments push Belarusians to look west, to countries with more stable economies and effective rule of law. Most Belarusians wish to get a Card of the Pole not because of sentimental attachment to Polish culture or pride in their ancestors. They want concrete material benefits – getting free visas with the prospect of receiving a residence permit and later citizenship of the EU, and the ability to work and study on equal terms with Polish citizens in a country with a three times higher average salary. Those who are not ready to move abroad wish at least to get the possibility of shopping and travelling. Ihar from Minsk, 30, has recently become a happy owner of a Card of the Pole. He told Belarus Digest that among his friends around 10 people already have cards, and it has become increasingly popular among young people. For example, a section of the largest Belarusian Internet forum Onliner dedicated to discussion of ways of getting a Card of the Pole has 3,000 pages – one of the most popular topics on the forum. Andrej Jelisiejeŭ thinks that the current economic crisis will definitely cause an outflow of Belarusians towards the west. Those not eligible for a Card of the Pole will use other opportunities, like seasonal works in Poland. If the Belarusian authorities want to stop the brain drain, they should in the first place enforce local border traffic and make efforts to liberalise or completely remove the visa regime with the EU. In a longer term perspective, the government should think of introducing a similar policy to attract ethnic Belarusians from abroad and provide them with special preferences. On 2 February 2016, Commissioner for Religious and Ethnic Affairs of Belarus Lieanid Huliaka criticised the Catholic Church for “insufficiently active cadre training” and “the destructive activities of some Belarusian priests among the population”. Two days later the Conference of Catholic Bishops in Belarus in an official statement defined these issues as “exclusively the internal affairs of the Church”. The Bishops suggested that all such questions “may be discussed in person”. Such a public exchange of opinions did not whip up Belarusian public interest. In recent years the Commissioner has become a mouthpiece for the authorities’ pretences toward Catholics. He raised identical objections to “cadre training” and activities among the population in 2014 and 2015. Nevertheless, Huliaka's public criticism does not threaten to embitter Church-State cooperation. After utterances in January 2015, Cardinal Secretary of State Pietro Parolin made an official visit to Minsk, Saint John Paul 2 Catholic Academy of Theology was registered and President Alexander Lukashenka honoured Fr. Česlaŭ Kurečka with a President’s award for spiritual revival. The political forays of the state officer have taken the form of proving the Church’s political loyalty. The Conference humbly rejects allegations, redirects dialogue to the sidelines and never criticises the Belarusian authorities. Around 80 per cent and 10 per cent of the population define themselves as Orthodox and Catholic respectively. The authorities recognise these confessions as the most legitimate and important. In 2009 Gallup research found Belarus to be one of the least religious countries in the world. According to these findings, religion plays an important role in the daily life of 27 per cent of Belarusians. International studies show that only 6 per cent of Belarusians attend church regularly. Catholics appear to be the more active believers: while 50 per cent of them attend Sunday mass, only 18 per cent of Orthodox adherents do so. Belarusian diplomacy sees good relations with the Vatican as a means of establishing an outpost in the Western direction. Officials and state media speak only in a positive way about the Church. Fr. Aliaksandr Amialčenia, Director of the Vatican Radio’s Belarusian Service, said that “in order to create a positive image of the country it is advantageous to adhere to a positive image of the Church”. The authorities have invited Archbishop Tadevuš Kandrusievič to the most important state events. 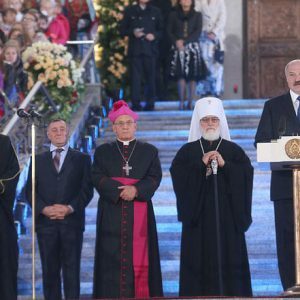 Recently the hierarch attended the Prayer for Belarus ceremony and sat in the first row during the fifth presidential inauguration of Lukashenka. Kandrusievič's presence at the official rituals of the Belarusian regime demonstrates the Church’s loyalty. Fr. Uladzislaŭ Lazar's detainment on charges of state treason seems to be the most explicit example of Church-Powers relations. On 30 May 2013 the KGB arrested the Catholic priest. Lukashenka revealed this in July, and it was later confirmed by the Conference press secretary. Archbishop Kandrusievič limited himself to a call to pray for Fr. Lazar. Despite numerous social efforts to oppose the priest's detainment, Catholic officials remained silent. On 3 December the authorities released Fr. Uladzislaŭ and the case has not gone to the court. Neither party has disclosed any circumstances around the arrest. Catholic hierarchs remain patient, even in the most extreme dealings with the authorities. Interests involved: what is at stake? After decades of atheism under the Soviet Union, freedom of religion has been slow to return to Belarus. The communists destroyed many churches and the majority of temples were used as warehouses or industrial plants. A shortage of priests, lack of administrative structures and temples in need of rebuilding remain the key problems today. Solutions to all these issues depend on the Belarusian authorities. Since 1989 Polish priests have been playing a significant role in the Church's revival. According to the Commissioner Office, they currently account for over 25 per cent of the total number of priests in Belarus. In criticizing “insufficiently active cadre training”, Huliaka was referring to the need to replace foreign priests with local ones. Reducing the number of Polish priests has been among his priorities for many years. According to Huliaka, “some Polish priests try to cultivate politics” and “they do not like our country, our law, the authorities”. The Conference of Bishops claims that in 2009-2015 the number of Polish priests declined from 168 to 113. A considerable number of them, despite protests by the parishioners, have not received the necessary permits to work in Belarus. Information about the majority of these cases bypasses the media, but fragmentary leaks show that in 2009 four Polish priests were refused visas, in 2012 – three, and in 2014 – two. A sudden decrease in the number of priests could greatly hinder the Church’s functioning. New parishes wait years for a temple construction permit and Lukashenka personally signs each one. The Catholic hierarchy, however, never expresses its concern about the issue publicly. The protest of parishioners in Hrodna in December 2006 has been the only deviation from this policy of silence. Fr. Aliaksandr Šemiet, after waiting ten years for a temple construction permit, organised a hunger strike. Five days later the authorities issued it. Aliaksandr Kaškievič, Bishop of Hrodna, was informed about a forthcoming protest, but huge support from parishioners and the priest's desperation meant that he could not forbid it. Pope Francis and Patriarch Kirill meeting: a new chance for Belarusian diplomacy? Some analysts treat the historical reunion of two Christian leaders in Cuba as a personal failure of Lukashenka. The Belarusian president has been an ardent supporter of such meeting in Minsk. Archbishop Kandrusievič enthusiastically stated that “the likelihood of the Pope visiting Belarus is greater than ever”. In the current struggle to normalise relations with the West, closer relations with Catholics create new opportunities for Belarusian foreign policy. It is possible that Archbishop Tadevush Kandrusievič will receive some extra bonus such as a Catholic shortwave radio broadcasting licence, for example. Any legal guarantees, however, seem unthinkable. In 2008, during a meeting with Cardinal Secretary of State Tarcisio Bertone, Lukashenka expressed readiness to sign a concordat with the Vatican. Since then, Minsk has frozen the bargaining process. Leszek Szerepko, former ambassador of Poland in Minsk, in an article published in Tygodnik Powszechny wrote that “the existing system which guarantees to the state a rich instrument of control and influence over religious communities” fully suits the Belarusian leader. The Catholic Church has rich experience of functioning in authoritarian regimes. Amidst endless public provocations, Archbishop Kandrusievič has avoided participation in the authorities’ game. In 2007 deputy Prime Minister Aliaksandr Kosiniec announced that “in four years there will be no foreign priests in Belarus”. Nevertheless, Polish priests continue to serve in the Belarusian state. Perhaps Catholic diplomacy in the corridors looks unattractive, but it remains effective.